I used to be smarter, or felt like I was, because The New Yorker arrived in my mailbox every week, a gift from my generous mother in law. I read only a small percentage of the pages and scanned the trademark cartoons. But I never missed “The Sporting Scene” pieces by Roger Angell, the legendary baseball essayist. What does this have to do with birds and birding? Well, it dawned on me that Angell’s prose could also apply to the exceptional spring migration we just experienced. As it trickled to an end around Memorial Day, the words gratitude and wonder seemed to fit perfectly. Truth is, I’m a little sad. It’s June and I miss May. Surely I’m not alone. Birders were spoiled rotten last month. Every spring migration is good, sort of like pizza, but I think most would agree that 2015 was a cut above. If you longed for warblers like cerulean, Connecticut and mourning, this was your year. Opportunities to witness these and other coveted species were abundant if you had the time and the gas money. I was a bit short on the former, so I settled for following most of the daily excitement vicariously. Not once did I make it down to Montrose on the Chicago lakefront—generally the hottest of the area’s hot spots. Highlights on the beach included snowy plover, piping plover, red knot, whimbrel, American golden plover and black-necked stilt. Up the coast in Evanston, a violet-green swallow made a brief appearance May 9, just 10 days after flock of 104 American avocets held a meeting on Northwestern’s beachfront. Not all the action was along Lake Michigan, of course; DuPage had its own share of avian excitement. Fermilab hosted a scissor-tailed flycatcher for several days in mid-May, plus blue grosbeak and black tern—quite a handsome trio. One of my favorite sightings this spring, a barred owl, also occurred at Fermi as I walked around during my son’s “Saturday Morning Physics” class. I tried and whiffed on the Fermi grosbeak but the next day was able to see one at Morton Arboretum. Apparently there are several blue grosbeaks at the Arb and possibly a nesting pair. Chicagoland is a little north of its usual summer range but blue grosbeak sightings are increasing around here. One was reported at Elsen’s Hill in Winfield, too, on May 28. 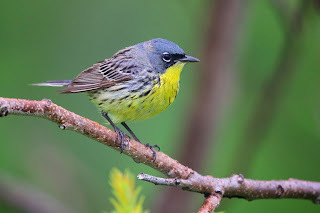 A week before, also at Elsen’s, a birder detected no less than five Connecticut warblers. The preserve also attracted a cooperative prothonotary warbler that many were able to hear and see. Observers on two occasions in May spotted a Mississippi kite drifting over the county, a reminder to always keep our eyes on the skies. Let’s face it, spring migration can be exhausting, and not just for the birds. As watchers, every day is filled with opportunities and choices. In May especially, we struggle just to keep up with the online postings of fellow tribe members. This spring I slowed things down a bit and cut back on the chasing. The price was a lot of missed birds—feathered treasures that slipped off down the dark waters. On the upside, I spent less time in the car and more time enjoying my backyard. Three pine siskins were still visiting the thistle feeder in late May. Will they ever go north? Could they nest here? My grape jelly feeder failed to attract the birds I expected. Instead of orioles or catbirds, a male cardinal is the surprise customer—first time I’ve seen that. And yes, that crazy robin I’ve mentioned before is still snacking on fallen peanut fragments in the grass. One of my best spring memories will be Family Night Out at Cantigny Park on May 15. The theme was birds and we lucked into a perfect evening for anything outdoors (including prom pictures!). The kids painted little birdhouses and then my friend Joan and I took the families on short bird walks. 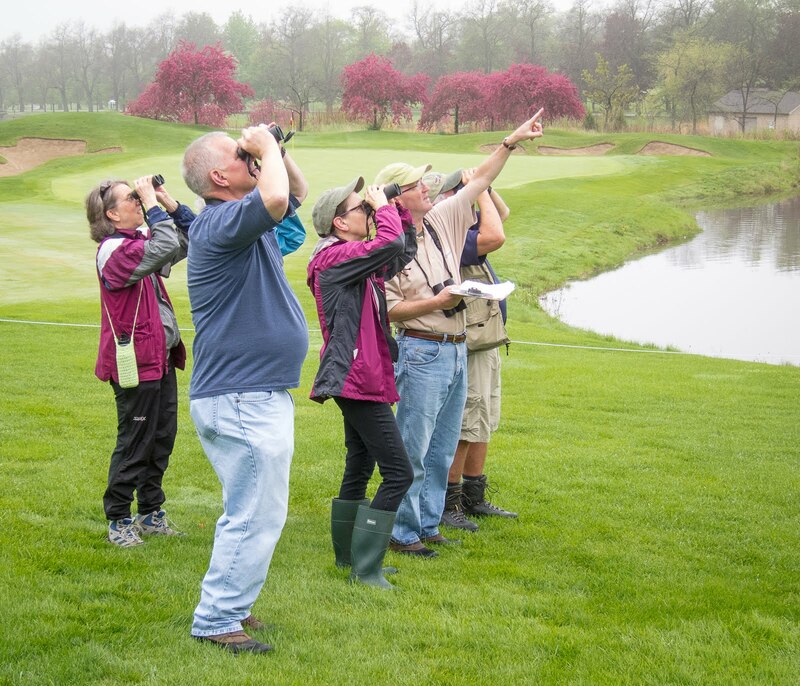 Children and adults alike were thrilled to see their first indigo buntings, Baltimore orioles and rose-breasted grosbeaks. It was like the birds wanted to be seen and heard. That, for me, is the magic of May—the best time of year to share the joy of birding. It is our World Series and tickets are free. Best of all, unlike baseball, the hobby doesn’t go on hiatus. We keep birding, no waiting for pitchers and catchers to report. June may not be as colorful and exciting as May, but there’s still plenty to see and learn. Hint: make a point this month to visit a grassland habitat. For watchers, every time of year holds promise. The gratitude and wonder never stop.